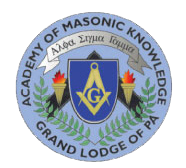 Thank you for your interest in the Pennsylvania Academy of Masonic Knowledge Masonic Scholar program. To be enrolled in the program, please complete the form. If the completion is successful, you will receive an email verifying your submission. NOTE: THIS PROGRAM IS OPEN TO PENNSYLVANIA MASONS ONLY. IF YOU ARE NOT A PENNSYLVANIA MASON, YOUR APPLICATION WILL NOT BE PROCESSED.